PT. Lubuk Sumber Jaya is a company that manages the Batam City Square Mall (BCS Mall), which is located in the city center, Jl. Bunga Raya, Baloi, Batam - Indonesia. Jalan Bunga Raya is one of the main streets in Batam city with heavy traffic every day. The existence of BCS Mall was the meeting of two roads, namely Jalan Bunga Raya and Jalan Penuin. Penuin road is a bustling trading area with a dense activity every day. As Shopping Center, Recreation and Entertainment, BCS Mall stands in the middle of commercial locations visited by people of the city of Batam, even international tourists. BCS Mall building consists of six floors (can be built up to 8 floors) with effective site of over 30,000 m2 and could accommodate more than 1,000 four-wheel vehicles in the parking garage of the building each floor of the parking directly connected to the center of the mall. Building facilities consist of AC Central, 2 lifts in the Atrium Hall, 2 elevator units in the loading area, 18 units of escalators, powered source of electrical power reserves that could supply the electricity needs throughout the building, installation of electrical wiring and telephone, Installation Springkle (smoke detector) and Fire Detector, complete security equipment and monitored. BCS Mall in collaboration with major tenants to meet the needs and wishes of the city of Batam, the Golden Truly Dept. Store, JC Supermarket, Gramedia Bookstore, KFC, TimeZone, Cinema 21. 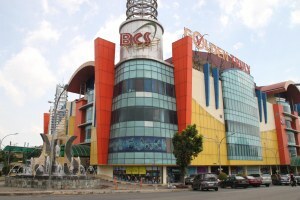 Moreover, completeness in BCS Mall was also met by King Electronics, Bowling, Billyard and Games Centre, the World Fantasy Children presenting Children Playground, Video Games, Restaurant, Food court , Internet Zone, and many more tenants who make BCS Fashion Mall as one barometer of fashion trends in Batam.